Unfortunately the Redditch Fire Station Open Day was cancelled due to bad weather. The following weekend I asked my daughter what she’d like to do and she replied “Go and see the real fire engine”, so clearly she had been looking forward to it. 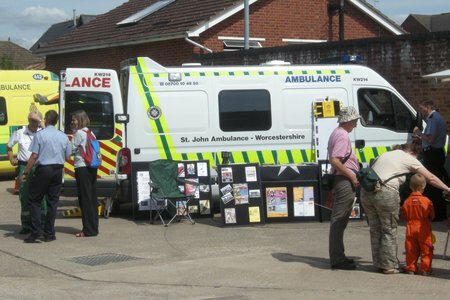 I went back onto the Hereford and Worcester Fire and Rescue Service website and found that there was an Emergency Services Day at Evesham Fire Station later that day, so we went there instead. There were lots of free goodies, including pencils, bugs, leaflets, comics and even a sports drinks bottle. We bought some toy fire helmets (&pound1 each for charity) and some donations for air ambulance badges and river boat flags, other than that and the car parking it didn’t cost anything. This entry was posted on Tuesday, August 11th, 2009 and is filed under Babies, Children, First Aid, firstaidquiz.com, Midlands, Redditch Worcestershire. You can follow any responses to this entry through the RSS 2.0 feed. Both comments and pings are currently closed.